I have never, and hopefully will never again, be happier to leave Disney than I was on the Saturday morning before Hurricane Irma hit Florida. Our Magical Express Bus was due to leave at 8 am and, already prepped from the night before, my husband and I shared a final cup of coffee on our balcony before heading downstairs for check-out. It was just before dawn, so the sky was dark, and the wind was picking up. It was blustery, and the swaying trees created an aura of foreboding (but really only because we knew Irma was on the way). 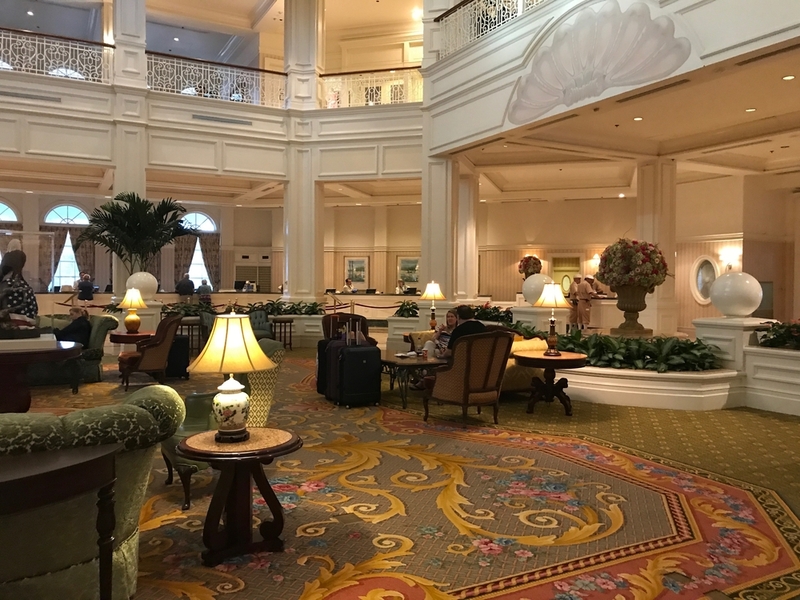 After checking out, we asked the Disney Cast Members at concierge how we could possibly thank them for all the exceptional service they provided. At this point we had witnessed many CMs comforting worried guests with smiles, patience and grace. This was especially moving after remembering that many of these CMs have homes, families, and friends here, and Irma is a dangerous threat to them, too. The CM said something surprising to me: the best thing to do is to tweet at @wdwtoday to give individual cast members #CastCompliments, and to do so again when you are surveyed at the end of your vacation. “We’ll be sure to do that,” I told the CM at concierge before heading out to catch our bus to Orlando International Airport. 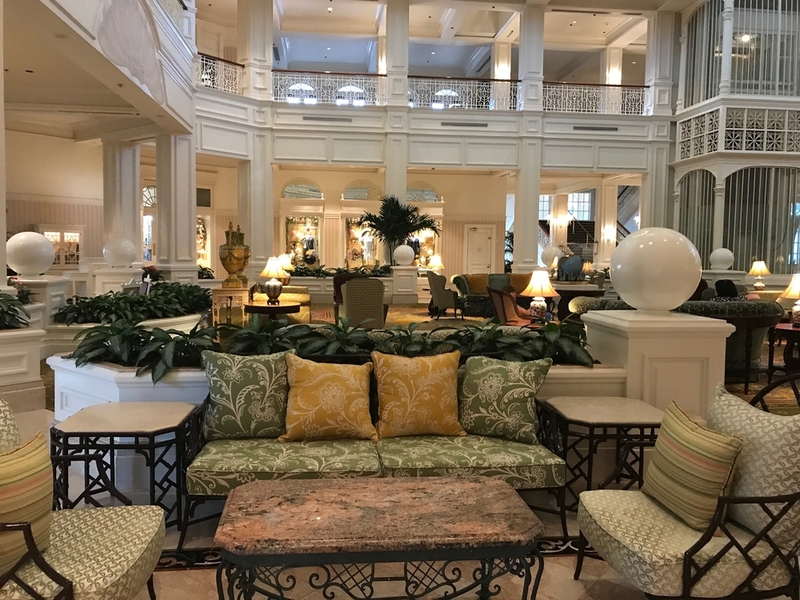 As I took a few final glances at the hotel’s lobby, I was struck once more at the calmness of the resort; at 8 am there wasn’t much traffic or movement inside the Grand Floridian. 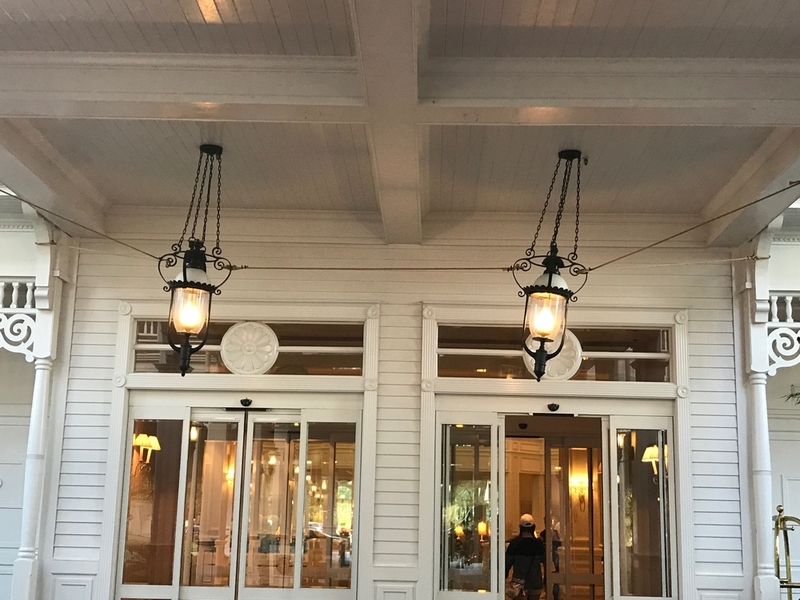 Outside the lobby, light fixtures had been secured with rope in anticipation of the upcoming storm. I have never seen the Magical Express Bus packed with so many people as I did on the Saturday before Irma (especially at 8 am). 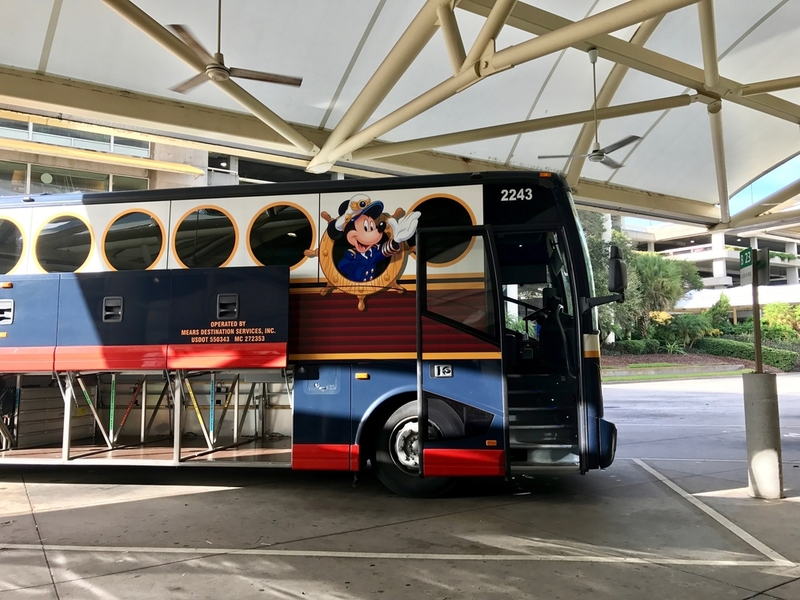 The driver wasn’t allowing any additional passengers without reservations, or without the proper documentation from Disney, to board. If you wanted to board, you needed to have previously reserved a spot. The bus that came was actually one for Disney Cruise Line, and I wondered if they were using these buses to accommodate high volumes of departing guests (the driver called this “the Disney exodus”). At this point, I had lots of pre-travel jitters. We were so close to the end, and for days now my sentiment had been “I’ll rest when we’re in the air.” While the skies were clear, and we had received no word of complications this morning at Orlando Airport, I wasn’t going to take anything for granted until that fat lady sang. Observing the other passengers on the Magical Express Bus, I don’t think I was the only guest who felt that way. Whenever the driver mentioned, “going to Orlando Airport,” or, “I’ll get you there safe and sound,” he received a round of applause. Everyone seemed grateful to be heading to the airport. Two hours after reaching Orlando International Airport, my husband and I were sitting on a plane, grinning to each other, and squeezing each other’s hands. “This is it,” my husband said. A few minutes later, we were in the air. All in all, I’m still in disbelief that we were able to leave Florida right before Hurricane Irma reached the state. It had been a long journey — nearly 5 days of strategic planning and persistence, and long travel (it took 13 hours for us to get from the Grand Floridian to our home in New York) — but in the end, we got home safe and sound. This experience has reminded me of the great insecurity of trying to “plan accordingly” during a hurricane; because storm paths and severity expectations aren’t confirmed, any decision you make could potentially be the wrong one. During this experience, I was very aware that every choice we made was little more than a calculated bet. I was also struck with the reminder that no one evades a hurricane without help. From our friends in South Florida, Orlando, and Tampa, to call representatives at Delta, Enterprise, and MCO, and Cast Members throughout the Walt Disney World Resort; so many people had a part to play in our successful exit, and undoubtedly in the stories of countless others trying to evade Hurricane Irma. 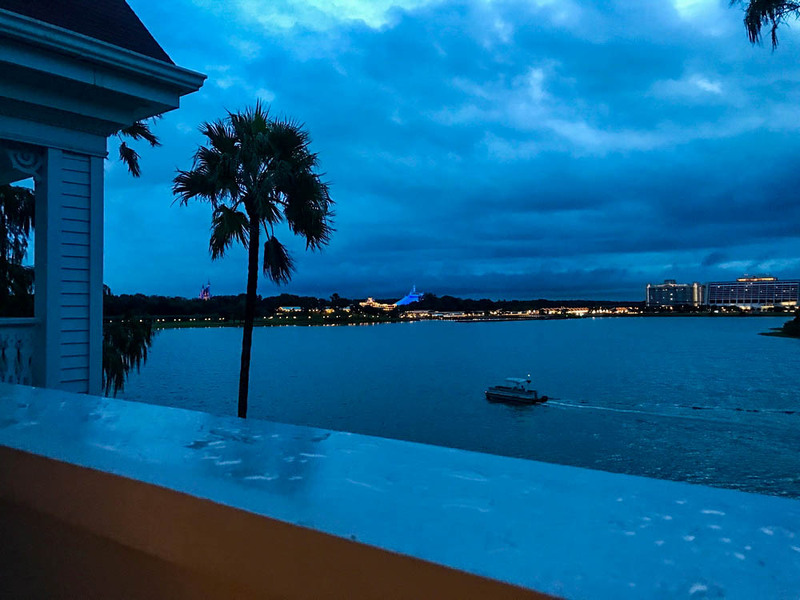 We are grateful for all the help we have received, and while we may think twice about visiting again during hurricane season, it’s endearing to see just why “Disney is a great place to wait out a hurricane,” as our Disney booking representative said. Not only for a generator, or transportation to the airport, or insurance that you’ll have necessities during an emergency, but because the resort’s people care about your happiness, your livelihood, and your safety. Thank you so much, Disney!